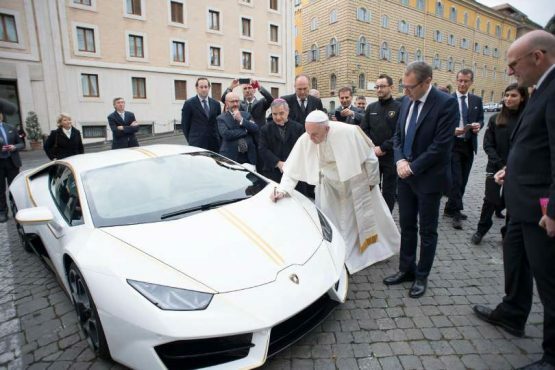 A personalized Lamborghini sport car has been given to Pope Francis as a gift but he plans to auction it to raise money for charity. Francis received the Italian super car on Wednesday morning in a ceremony in Vatican City. He blessed it, signed its hood, and promptly handed it over to Sotheby’s, which will auction off the Hurricane on his behalf. The special-edition sports car, which boasts a 610 metric horsepower, is expected to sell for significantly more than its Italian retail price of around €200,000. The money will go towards helping displaced Christians in Iraq, victims of trafficking and prostitution, and Italian charities working with women and children in countries in Africa. 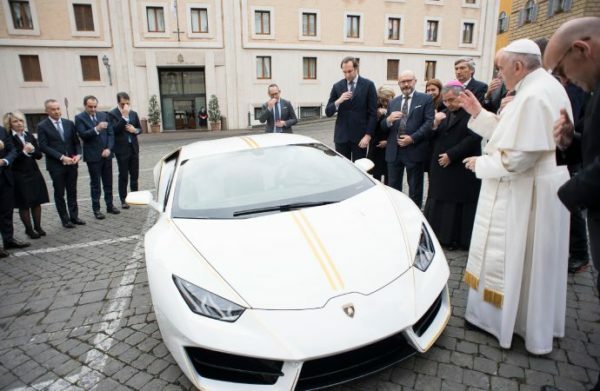 Last year the Pope ordered cars he used during a visit to Poland to be auctioned off to help Syrian refugees. And in 2014, he sold a Harley Davidson motorbike that he had been given – and a matching leather jacket – for the benefit of a homeless shelter in Rome.